Yesterday, we celebrated Fashion Revolution Day. Since April 24 2014, the #FashRev campaign has spread to over 60 countries, with tens of thousands of people participating. The campaign wanted consumers to ask brands whether they source, sew, dye and ship their products under eco-friendly and humane conditions. 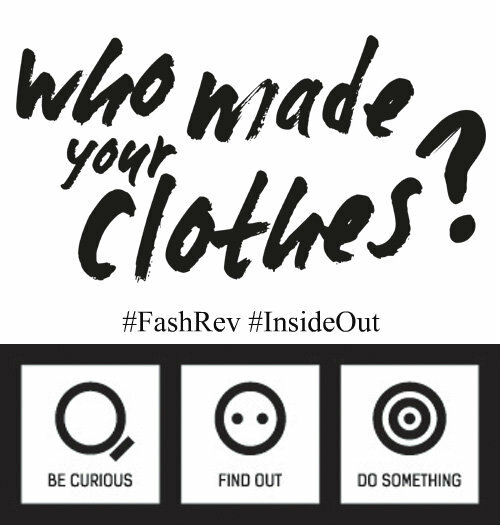 To aid this, consumers were asked to include the hashtag ‘#whomademyclothes’ as they debated this very question. The movement was a direct result of the one-year anniversary of the Rana Plaza factory collapse in Bangladesh, which left 1,133 people dead and more than 2,500 injured in April 2013. Many fast fashion brands were called into question including Zara, Mango, JC Penney, Joe Fresh and Children’s Place. After the collapse, retailers set up a fund to compensate the victims of the collapse. Most recently, it has been noted that this fund is severely underfunded. The shortfall, together with late payments, means around 3,000 people who worked at Rana Plaza or are family members of those who died are still waiting to receive 30% of the $30m workers’ rights groups say they are due in compensation. Therefore, the simple yet direct question is asking the fashion industry to be more accountable than ever, and to be more transparent. Transparent, not just about the nature of their production practices, but also about how the industry is correcting its past errors. Therefore, we should not just be asking this question one day a year, but every day, with every outfit we wear and every dollar we spend. As we celebrate Earth Day 2015, we decided to highlight one way we choose to stay eco-conscious, while still providing quality, fashion-forward products through our various collections. Straight from the jute fields to our Silk & Coco collection, our Jute Envelope clutches are made of natural jute fibre and natural jutton. te, a fibre that is also called ‘hessian’ in North America, is a natural, highly affordable, versatile, biodegradable and renewable fibre. Jute is known to have characteristics like high intensity, long durability, fire and heat resistance, and silky luster & texture. The clutches have been custom-designed and hand-woven by a group of underprivileged women artisans in Bangladesh who have faced many hardships in their lives. From informal-to-formal, day-to-evening or spring to summer, these clutches are the perfect, environmentally-friendly addition to your closet.